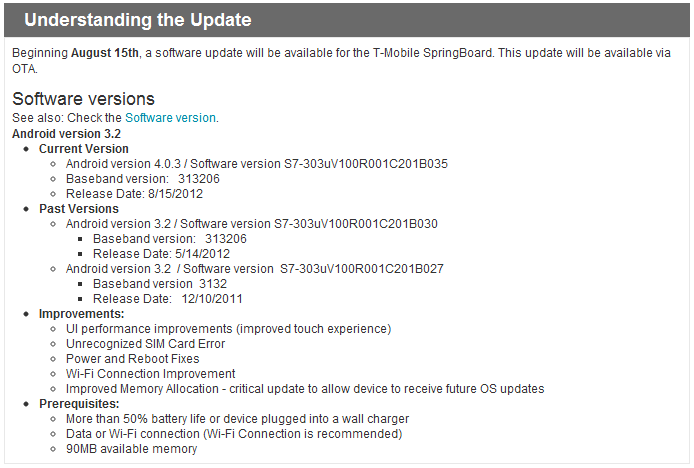 T-Mobile has just updated the supports documents for the Springboard tablet, and owners are in for a welcome surprise. The device might not have attracted much attention when it was launched, but now it's getting some sweet Ice Cream Sandwich action. Users can anticipate an OTA update to start hitting devices on August 15. It's understandable that you might have forgotten that the Springboard existed, but it wasn't a bad device before the Nexus 7 arrived in the same niche. The Springboard is actually a branded version of the 7-inch Huawei MediaPad. It has a 1280x800 IPS screen, 16GB of storage, and T-Mobile's HSPA+ "4G" data. The Springboard is running a dual-core Snapdragon S3 ARM chip clocked to 1.2GHz per core. That chip is getting a little long in the tooth by today's standards. The Springboard is still selling for $299 on-contract. 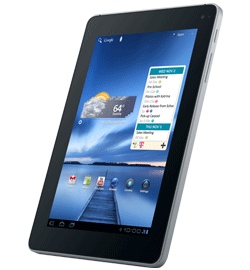 The update takes the tablet up to Android 4.0.3 from version 3.2 (Honeycomb). The user interface will obviously be getting a long overdue makeover in the update. Other improvements include a fix for SIM card errors, power and reboot fixes, better Wi-Fi performance, and improved memory management. Users will be able to manually trigger the update in the system settings provided the device has 90MB of local storage free and at least 50% battery life.